The T D Noone neon sign, erected in 1967, is a double-sided pedestal-type sign, comprising a elongated rectangular metal box mounted atop a tall metal pole. The two faces are painted red, with white lettering that spells out the words TEE DEE in large cursive script and SCHOOL WEAR in a smaller san serif font, with a striped tie motif alongside. The T D Noone neon sign is of historic and aesthetic significance to the City of Moonee Valley. Historically, the T D Noone neon sign is one of a small number of vintage pedestal neon signs that survive in Victoria, demonstrating an signmaking technology that was ubiquitous from the 1930s to the 1970s but is now largely superseded. Aesthetically, the T D Noone sign is a prominent and distinctive element in the Keilor Road industrial streetscape. Although of relatively conventional form in contrast to certain other pedestal neon signs (eg Metropolitan bowling alley in Moonee Ponds), it nevertheless incorporates various font styles (both block lettering and cursive lettering, the latter a recurring theme in neon signage) as well as the company logo, in the form of a small necktie. The T D Noone complex consists of several discrete buildings. The shed-like building at No 537, with its brick facade and stepped parapet, is evidently the original building occupied from 1958. The adjacent factory at No 541, built in 1967, comprises a sawtooth-roofed concrete block building with a flat-roofed single-storey painted brick wing along the street front. The latter has a canted facade with an elongated strip window (since concealed by metal sheet signage) and full-height timber-framed shopfront windows to the left side. At the rear is a detached fibro-clad building with steep skillion roof and timber-framed windows. The neon sign is a pedestal-type sign that stands in front of the 1967 factory. It comprises a metal box, approximately 2 metres long and half a metre high, elevated about 3 metres from the ground on a metal pole. No manufacturer's name is evident. 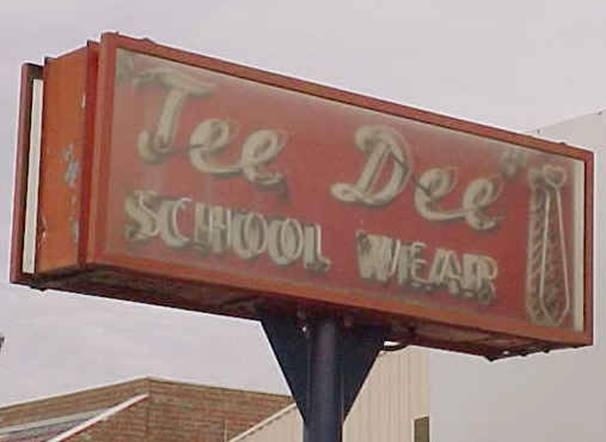 The two faces of the double-sided sign are painted red, with white lettering (delineated by neon-filled glass tubing) that spells out the words TEE DEE in large cursive script and SCHOOL WEAR in a smaller san serif font, with a striped tie motif alongside. Both sides of the sign are protected by clear glass screens. The neon sign is substantially intact, still retaining all of its neon tubing.